cinco de mayo brownies | I Should Cocoa! The days are getting longer and it’s time to savor the lingering sunny hours with friends, food, and oh yeah – margaritas. Cinco de Mayo is a perfect excuse to fire up the grill, chop up some taco fixings, and have an ice chest full of Pacificos and Mexican Coke. After a bit of sun, two or three too many tacos, and an empty ice chest, you and your guests are going to experience a wicked sugar crash – will you be prepared? Save the day with a plate of Mexican chocolate-inspired brownies (I mean really, who doesn’t like brownies?). The sweet, fudgy brownies in this recipe reflect the flavors of Mexican chocolate: chocolate, cinnamon and almonds. They’re super easy to make and home-made brownies are so much more delicious than the boxed stuff. The only substitute I made (and definitely recommend) is semisweet chocolate chips as the milk chocolate makes these overpoweringly sweet. For me, these brownies were even better the next day. Keep them in the fridge and let them come to room temperature before eating – the consistency after refrigerating is more fudgy and the chocolate chips creaminess really coming through. The topping starts out like dulce de leche, a sticky caramel that dries into a crisp glaze. 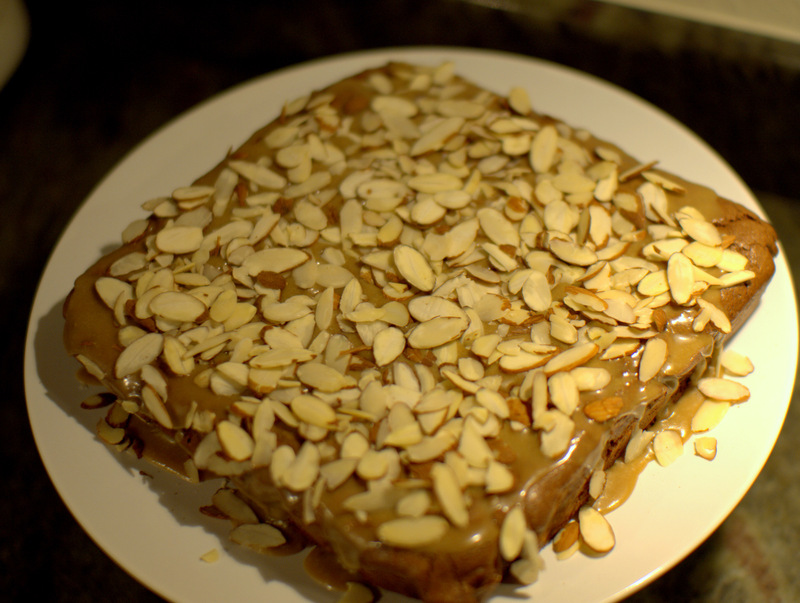 I could have done with out its excessive sugariness, but it does keep the almonds on (and the almonds are integral), maybe next time I’ll just drizzle melted dark chocolate for the same effect. 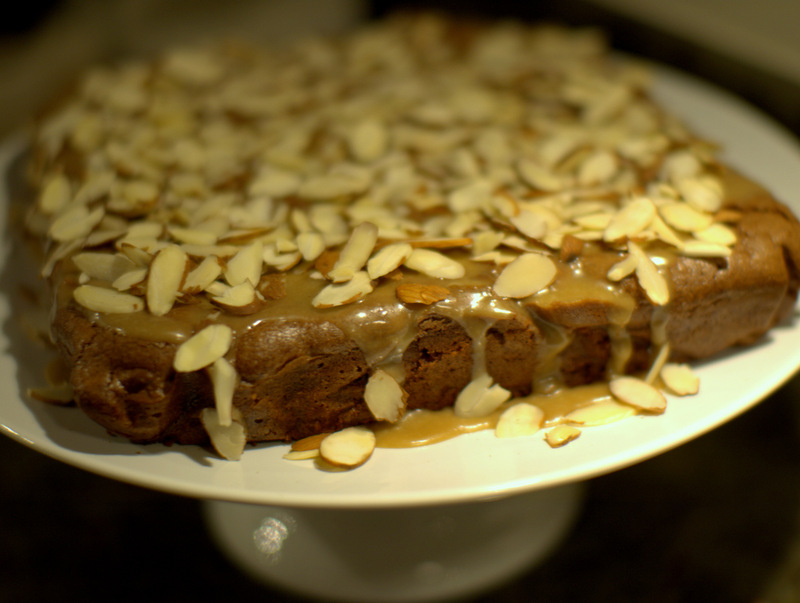 This entry was posted in baking and tagged almond, brownie, chocolate, cinnamon, mexican. Bookmark the permalink. Pingback: pescado a la veracruzana « I Should Cocoa! why am i not there when you make this stuff?? I wanna be a homeless person outside your apartment eating the crumbs from your kitchen.